Elmo Motion Control (Elmo) designs, produces and implements comprehensive, field-proven motion control solutions that make clients’ data-driven, smart machines smarter. The company’s R&D department combines intelligent motion control technologies, real-time programming and control algorithms with advanced digital hardware to enable leaner, more flexible machines. Controlled by the Elmo application studio (EAS)—a software environment that cuts integration time and maintenance costs—Elmo’s servo drives and multi-axes motion controllers minimize a machine’s footprint and cabling, improve throughput, and give original equipment manufacturers (OEMs) a competitive edge. Founded in 1988, the company is headquartered in Israel, employs more than 350 staff worldwide, and has a dedicated presence in the United States, China, Germany, Italy, Korea, Poland and the United Kingdom. Elmo is at the forefront of R&D in motion and automation, providing small, compact, powerful, efficient, and highly durable motion controllers and servo-drives. We view the US technology market as constantly expanding companies involved in manufacturing, robotics, and automation. With 30 years of experience, our complete motion solutions offer the US market answers to their highest demand for performance, efficiency, and consistency. By exhibiting in IMTS Elmo is looking to demonstrate to all present the potential for all applications to become smarter and more competitive in their industries by simply using products that are ahead of the technological market race. With ease of implementation and rugged miniature drives the OEM is able to reduce cabling and hardware significantly reducing the cost of the project as well as the overall size of the components involved. Showing an efficiency of over 99%, fans, and heat sinks needed to dissipate wasted power in the form of heat are a thing of the past. With Elmo's motion solutions the limits of the application are solely in the imagination of the engineer. Elmo has doubled the power of its ultra-small, already powerful servo drive, the Gold Twitter, to suit the most demanding applications in the era of Industry 4.0. With a weight of only 33 grams and continuous currents of 160A (80V) and 140A (100V), the new Double Gold Twitter delivers over 10,000w of qualitative power, proving a great fit for applications that require a reduced footprint and high power, such as large robotic vehicles, antennas and tracking systems, high power machine tooling, large printer rolls and more. 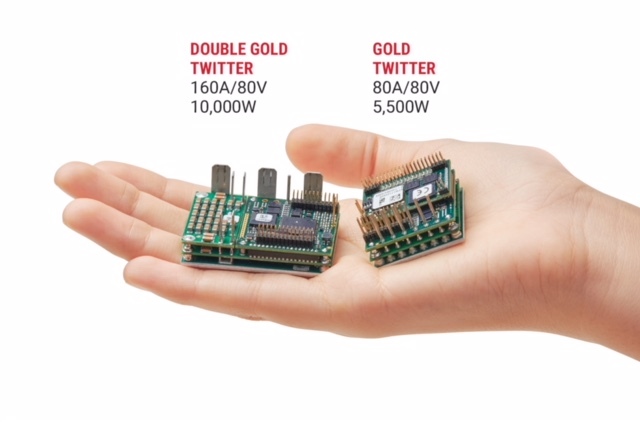 The Double Gold Twitter is among the smallest STO-certified (IEC 61800-5-2, SIL-3) servo drives on the market. It features Elmo’s proprietary and innovative Fast and Soft Power Switching Technology (FASST), which ensures optimal power-device switching and delivers over 99-percent efficiency and negligible electro-magnetic interference (EMI).This extreme efficiency allows for its miniature size, meaning that the Double Gold Twitter can be placed on a moving load, on the motor or inside the motor, helping engineers save space, improve machine performance, reduce cables and eliminate electrical cabinets, while delivering unprecedented power. Elmo’s Platinum Maestro is designed to significantly extend and enhance the power of motion control, connectivity, and performance, while focusing on ease of use. The Platinum Maestro exhibits Cutting Edge Motion Control Technology, a Fast & Simple Machine Development Process with stable throughput, and lasting reliability. The Platinum Maestro Motion Controller incorporates an integral high-level computational multi-core system with limitless memory (RAM, ROM, and SD-Card), and on-board additional hardware peripherals. Extremely efficient EtherCAT networking, with a cycle time down to 100µs the Platinum Maestro provides precise motion for any project. On Tuesday, September 11, 2018 @ 3:15PM to 4:10PM room W196-A, we are solving The "Paradox of Smart Manufacturing", first prize winner at the SPS Award 2018 under the topic of "The challenges of automation: efficiency and flexibility"., presented by Tomer Goldenberg. Elmo Motion Control has been a leading provider of servo drives and multi axis motion controllers for 30 years. We are constantly looking for projects that will push the limits of what is possible. The Chicago Architectural Boat Tour and Navy Pier are two great intakes if the weather is permitting. If you are looking for an indoor activity and have the time check out the native sport Whirly Ball, this unique game will provide a team building competitive fun outlet.